Newly-crowned Wrestlezone Undisputed champion Rudo Lightning has confirmed he will defend his title at Aberdeen Anarchy against Damien – if officials meet a number of stipulations. Wrestlezone's Crusher Craib has warned he aims to humiliate Scottish ring favourite Grado at Regal Rumble tonight. If you’re not a wrestling fan, Sheffield United striker Billy Sharp’s goal celebration against Norwich may have been completely bewildering. WWE star Toni Storm received the support of fellow wrestlers and a community of fans after private photos of her were leaked online. The stakes were high but Mr P secured the Wrestlezone Tri-Counties title by defeating holder Zach Dynamite – on his 40th birthday. This week we’ve searched our archives for some of our favourite images from wrestling events in the north-east over the past few decades. Wrestlezone star Damien today vowed to recapture the Undisputed championship belt he believes was unfairly taken away from him. Scottish wrestling star Grado today insisted his tag-team partnership with WWE legend Santino Marella is a coup for Aberdeen-based Wrestlezone. A wrestling show due to hit Aberdeen has been cancelled following the promoter’s collapse. Wrestling legend Rob Van Dam today promised Aberdeen grappling fans they will witness the hottest ring action around when top stars come to the city next week. Commonwealth Games wrestler Viorel Etko triumphed in his final competition before heading Down Under in April. Reigning Undisputed Wrestlezone champion Damien today warned he will retain his belt in a title rematch with Shawn Johnson. A new wrestling club for youngsters will start tonight at Kincorth Community Centre and is open to Primary one to secondary three. Scotland's Wolfgang failed in his bid to lift the WWE United Kingdom championship as big time wrestling returned to the Granite City. A wrestling legend is on his way to the Granite City – to star in an event which will be televised around the UK. 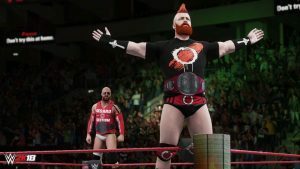 WWE 2K18 isn’t officially released until Tuesday, but those lucky enough to get hold of the deluxe edition have already had a few days with the game – and have been noticing some interesting glitches. Wrestling is a huge business filled with stars with massive crossover appeal – all the way from the likes of The Rock to the WWE Hall of Famer currently sitting in the White House. Rising tag-team star Chad Gable today vowed to show Aberdeen’s WWE fans his new partnership has major title-winning potential. Wrestlezone star Scotty Swift was hospitalised having suffered concussion in his grudge match with Crusher Craib at the Battle of the Nations. WWE’s first ever UK champion Tyler Bate has been confirmed to fight in Aberdeen in a major coup for WrestleZone. Aberdeen sports writer Sean Wallace is set to link up with wrestling star Johnny Lions at Aberdeen Anarchy on Saturday in a unified bid to beat Damien. Ring legend Melina today admitted she is "heartbroken" that she will not be able to wrestle in Aberdeen due to injury. Wrestling legend X-Pac was arrested with a haul of methamphetamines and cannabis chocolate bars as he tried to board a flight to the UK, police have said. Some of the hottest stars in the world of professional wrestling set to go head-to-head in Aberdeen. The future of pro-wrestling in the North-east is bright as a full-time training facility with full-size ring has been opened by the ambitious WrestleZone. Scottish wrestling sensation Grado today vowed to one day lift the WrestleZone Undisputed Championship after suffering title agony in Aberdeen. WWE Wrestling superstars returned to Aberdeen for the first time in six years and served up a world title fight. North-east wrestling fans are in for a treat this summer with the news that former WWE Superstar Shane Hurricane Helms has signed up for Aberdeen Anarchy this June. Mighty WWE legends Carlito and Tatanka have been announced as special guests of a North-east wrestling group’s showpiece event.